So with this Star Wars themed power tube, you can charge your smartphone, iPhone, GPS, portable game device, anything that can accept a 5V charge. Handy to have with you when you need emergency power, or you are in the middle of that text, and your phone begins to beep at you that it is low on power. 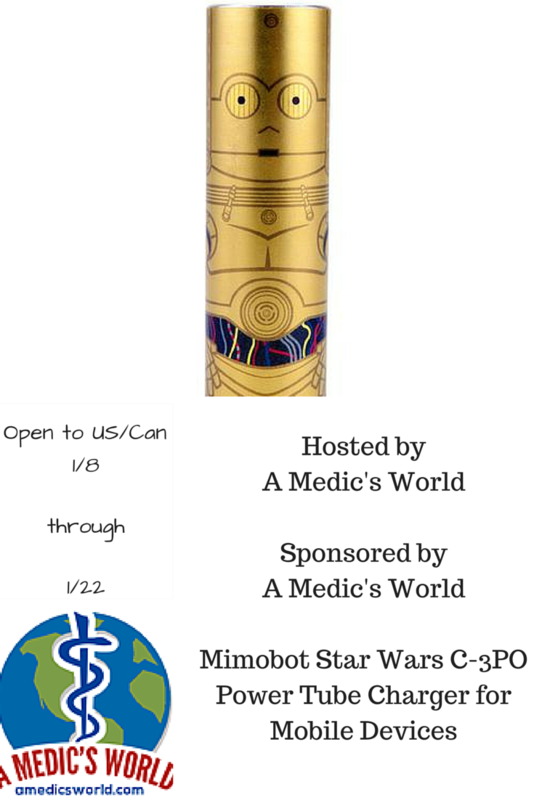 A Medic’s World and a group of wonderful bloggers are helping promote this great giveaway. Need to know more information about them? Check out the full review that Tom over at A Medic’s World did here. Giveaway is open to residents of the United States and Canada, 18 years of age and older. One entry per household. Winner will have 48 hours from announcement email to respond or a new winner will be selected. A Medic’s World is responsible for prize delivery. My favorite are Ewoks. I would give to my daughter. I know she would use it a lot. My favorite would have to be Yoda! I like little yoda best. So Cute. This prize would be for myself and my family. My favorite is R2D2…I would give this to my daughter in law. I love Yoda! He’s adorable, I just what to hug him! I would be the one using it! Luke! I know my son would love this! I would let my brother use this since he helps my parents a lot and has to have his cell at the ready.